New Land Rover Defender SVX has been test driven, and yes the old generic British 4×4 is still being made. The Defender is now running off a revised 2.4-litre four-cylinder turbo diesel Ford engine. 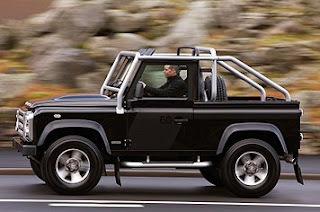 The Defender comes in both soft top and hard stop station wagon. It’s not very quick, but thats the same as all Defenders. This one is very easy to drive though, thanks to the flexible power delivery of the engine. It’s a much better Defender to drive, compared to the last ones, it is now more comfortable. Like all Defenders it handles very well off road because of its high clearance. Only 90 of 300 Defender SVX models will be sold in the UK. So it will be a rare car, so the starting price will be steep. The auto insurance quotes aren’t known yet either.